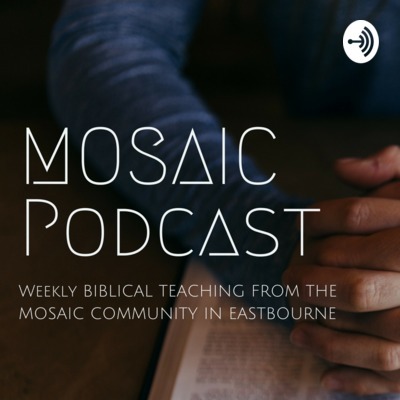 Join us for our weekly talks from Mosaic Church, Eastbourne - a church in the community. Inspirational, Biblical and often challenging messages that help us follow Jesus. This sermon is part of a series on the Cross in the run up to Easter. Dave explores ancient concepts of redemption, applies them to the accounts of the Cross and applies them to our lives today. Steve explores a challenging passage about who we submit to. He roots us back into the life of Christ to help us grasp a concept that challenges us all. Starting a new series unpacking 1 Peter. Steve Blundell leads us while Dave Roberts shares a talk about loneliness. Reaching out to those who are stuck indoors and through choice or illness shrink away from the world. Caroline Kimber starts our Mythbuster series, looking at the topic of Angels and ensuring we have a strong biblical overview of this important topic. Steve Blundell kicks off 2019 by looking at our vision and values as a community - it's all about Jesus. Lead by Dave Roberts, talk by Caroline Kimber. How would we see Christmas if we just landed on the planet...so to speak. Last in the book of philippians. Dave Roberts Leads, Sharon Roberts Speaks. Contentment comes from our God in whom we trust. Conventional vs Biblical wisdom. We are not created to find contentment in material things. Our contentment can only come as we rest in Jesus. Steve Blundell teaches - Real unity happens when our hearts and minds are united in the gospel for the sake of the gospel. See Timothy and Epaphroditus? Sending out the 72? What steps will I take to further the gospel this week? Can I do this with someone else as well? Steve Blundell Intro Prayers. Caroline Kimber teaches humility , salvation comes from God alone. Not Works. Our source is Jesus Christ, the only real accomplishment is to know Jesus. Steve Blundell unpacks Paul's 'therefore' statement in Chapter 2 and looks at the call to live in unity through Christ. Dave Roberts looks at the problem of Suffering and how our faith in Jesus can help us process the 'stuff' of the world. This week Sharon Roberts takes us through philippians and the subject of living together, Dave Roberts leads us in prayer. Steve Blundell Starts our new series looking at the book of Philippians by tracing Paul's encounter with grace. Dave Roberts brings teaching around the subject of money and how we can use it to bless those around us. Caroline Kimber leads the church whilst Sharon Roberts talks about grace, going that extra mile in situations where being extra gracious is special and can have positive or unexpected outcomes. Dave Roberts looks at the well know passage from Luke 10 and encourages us to look again at the story and it's impact on us today. Caroline Kimber looks at one of the themes in the Bible and encourages us to look at the first instances and how every story/theme whispers Jesus' name. Dave looks at the 'buts' from Matthew's account of Jesus' teaching and focuses in on Forgiveness. The last in our Freedom in Christ Series, Caroline looks at what we need to do and what God has already done. Caroline looks at how we need to take practical steps in Supernatural power. Dave Roberts helps us unpack and use practical Biblical Wisdom to provide pathways to help us all handle our emotions well. We take the battles we face to the next step, looking at some of the themes we all face and what the Bible says about them. Focusing in on What has God Said? What has God done and Where is God now? Steve unpacks the spiritual battles we face and how we can through Christ overcome them.